Stella Blackstone is the pen name of Tessa Strickland (although she authored some books under her legal name as well). Friday, June 6, 2014 from 6:30p.m.- 7:30 p.m Books & Company BIKES! Join Miss Lisa N. as she reads stories about BIKES and the ducks, bears, frogs and kids that ride them! We will make streamers or spoke decorations for your bike. We'll even eat our own bicycle wheel treats! We'll be reading Best Bike Ride Ever, Duck on a Bike, Bear on a Bike, Everyone Can Learn to Ride a Bike and Froggy Rides a Bike. 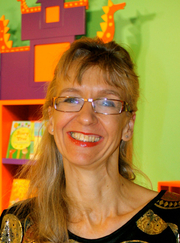 Tessa Strickland was the editor-in-chief of Barefoot Books, the publishing house that she cofounded with Nancy Traversy; she retired at the end of 2016. Strickland and Traversy founded the press as a home business when they were both young mothers in England in 1992 and later moved Barefoot to Cambridge, Mass. Stella Blackstone is currently considered a "single author." If one or more works are by a distinct, homonymous authors, go ahead and split the author. Stella Blackstone is composed of 3 names. You can examine and separate out names.